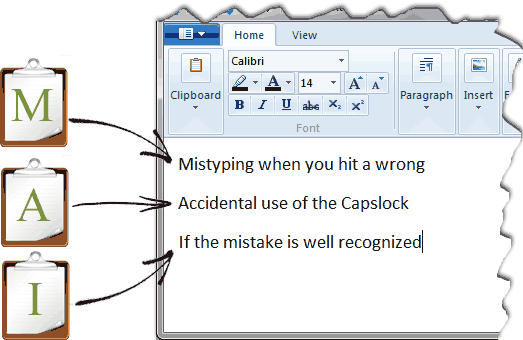 At any time, you can copy the current text selection into a specific clipboard by typing the clipboard copy hotkey. For example, typing Ctrl+[+A will copy the selection into the clipboard A, typing Ctrl+[+M will copy it into the clipboard M and so on. Similarly, you can paste a text from a specific clipboard by typing the clipboard paste hotkey. 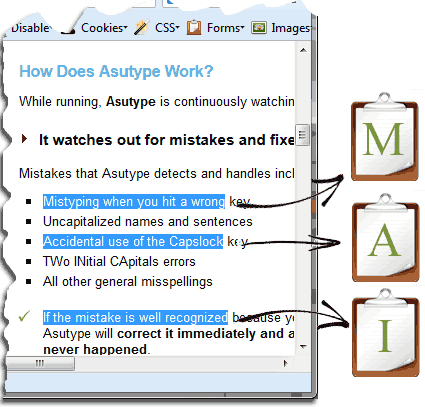 For example, Ctrl+]+A will paste the text out of the clipboard A and Ctrl+]+M will paste the text out of the clipboard M.
Having multiple clipboards allows you to copy and paste multiple pieces of text at the same time without the need of switching back and forth between the source and the destination of the copy and paste operations. Asutype's clipboards are deterministic by their keys. Once you have copied a piece of text into a clipboard, its content will be the text and will be there until you either empty it or overwrite it by a new content. This deterministic nature of Asutype's multi-clipboard is greatly different from other ordinary "multi-clipboard" systems, where the clipboards are juts items in a list and the order of the items is shifted every time you copy a new text. It is faster to access each clipboard by its hotkey, especially when you do multiple copy and paste operations. For example, supposed that you want to copy a piece of text from an article, its author's name and the article's title into your notebook application, you can copy the excerpt into the clipboard E(xcerpt), the author's name into the clipboard A(uthor) and the title into the clipboard T(itle). After switching to your notebook application, you can just paste the excerpt out from the clipboard E, the author name from the clipboard A and the title from the clipboard T. It's quick, easy and natural.